Captain’s Log: this will be my final entry. It’s incredibly difficult to write those words. It’s also incredibly difficult to express what each of you who have enjoyed and supported STAR TREK CONTINUES have meant to us. It has been perhaps the greatest privilege of my life to have created this series with so many amazing people. The words “thank you” will never suffice to express my gratitude to each and every member of our cast & crew. Only those who were actually there could ever know the amount of effort, sweat, time, passion and love that went into every episode. This series was created for one reason and one reason alone…. to pay tribute to the original series of Star Trek. There were no ulterior motives, no money made, no dreams of stardom or expectations of future opportunities. We made it for love. Our STC production family had a great deal of fun making this series and forged life long friendships. I hope some of that love and camaraderie came through on screen. I look forward to meeting many of you at conventions in the months ahead. May you all have a very Merry Christmas and a Happy 2018. Live long and prosper… and thank you for taking this journey with us. Thank you for all the hard work! It was a great series! Wonderful beyond words! Especially enjoyed Pilgrim of Eternity and Fairest of Them All -- wonderful to see a new episode continue an original episode. Merry Christmas and Happy Holidays to everybody involved in this project. Thank you for the great labor of love! I never enjoyed any of the fan films until STC. Your efforts reached a role of professionalism that helped raise the bar across the board. You guys should take some credit in that Star Trek Discovery is as good as it is. Best of luck to crew and cast! I want to thank you one and all for the hard work that you've done in keeping Star Trek OS alive. These last few years and 11 episodes was a great tribute to the original cast and crew of the starship Enterprise. Thank you for the memories and I wish you all a happy future wherever it may take you. Also, thank you to the staff, crew, producers, writers, actors and everyone else involved (including CBS) in making STC a real tribute and part of the Star Trek Canon. Where some see love, others see only opportunity. Shame you had to end . It was a wild ride. Congrats to everyone who worked on the series. We had a great time. Really sorry to see your Enterprise come to an end - because of the greedy big film industry - I have enjoyed the ongoing stories, it keeps the trek future alive in peoples imaginations. "Live Long And Prosper". Thank you Vic for your amazing work on bringing us all back to the final frontier! Thanks to you, the cast and crew! May your future find you well and may the wind be always at your back. Live Long and Prosper. Thank you Vic, and to all of the cast and supporting members of STC! 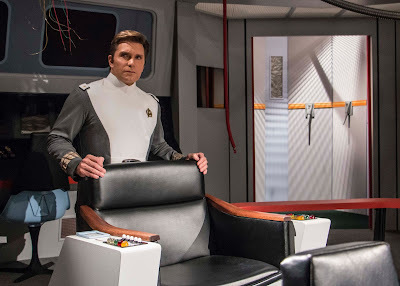 The STC series is an awesome tribute to Star Trek TOS that I watched growing up. Everyone reached a level of professionalism that helped raise the bar and produced a truly wonderful series. Thanks to everyone for the memories,including CBS in making STC a real tribute to Star Trek TOS. I only hope that CBS / Paramount will see the professionalism that everyone has put into this series and hopefully offer everyone an opportunity to continue the journey starting after the first motion picture and Enterprise refit. I wish you all a happy future wherever it may take you and may the wind be forever at your back!! Thank you for the ISO files and the artwork. That was incredibly generous and such a nice gift to fans that already appreciate you so much! What an amazing accomplishment. Your's was simply the best, and your passion for the series and chemistry showed in every episode. While I am saddened to see it end, perhaps someday, someone will pay homage to THIS series, maybe a "Star Trek Continues...Continues" ? I was holidaying around the world and couldn't get any TV or Netflix and needed my Star Trek fix so turned to YouTube and found you 3 days before you released the last episode. I’m in awe, totally blew me away that you could conceive of and create this masterpiece. It felt like one of the best presents that the universe has ever given me and so I wanted to profoundly thank you for this gift and your amazing efforts in making it, truly exceptional and inspirational. We are all sad to see this series come to an end. It truly was a fantastic tribute to the original series and having notable connections to the old series was more than fabulous. So now, what next? Thank you for putting this together! It's really great! I can't begin to thank you and all the people who made the effort to make Star Trek Continues the honest tribute and fitting conclusion it was. Well done. I enjoyed every episode. To everyone involved in making these, you did a fantastic job of carrying Roddenberry's vision to a fitting conclusion to the series. Mr. Mignogna, your performance as Captain Kirk was the best I have ever seen. You were completely convincing in the role and I thank you for your incredible effort to do his character justice. To your team's incredible effort, Thank you! I just watched Lolani. This was an impressive episode. I found it refreshing that Captain Kirk was defeated. However, the portion after Lolani and her captor left the ship was awkward. If the episode had ended with them leaving the ship and possibly her taped message, that would have been sufficient. it would have maintained Lolani as the supreme hero of the episode and Kirk as compromised. I think that would have been a more interesting story and added depth to Kirk's character. Of course, the message about the brutality of dehumanization/slavery was very powerful. In spite of the weakened ending, a very effective episode, it could have been stronger though. Vic, the love and effort that you and the STC crew poured into these episodes really shines through! In viewing them, I felt the same sense of hope and inspiration as when I watched TOS. It's to bad the powers that be don't realize that your endeavors only serve to enrich the Trek universe. In time, I hope that will change. As Kirk once said, "there are always possibilities." A Happy 2018 to all of you at Star Trek Continues, too! What you have all achieved is nothing short of incredible. I've been a Trek fan since the 1970's and though ST:TNG was ok-ish, I had given up by Voyager - too much space 'soap' opera for my liking...I really couldn't get excited by Worf's kid's problems, or how Chief O'Brien and Keiko were going to redecorate their new living quarters. Snore.The essence of really great sci-fi is an idea; one perhaps we all may have cogitated on at some point: 'What if...?'. Well, TOS had some amazing writers, but every script of STC has surpassed those efforts, and managed to bring the issues a contemporary feel, without feeling 'preachy'. CBS/Paramount - you simply have to put this on prime-time and syndicate it as per the original series. The STC people have done what you, with all your resources, have been unable to do, ie: catch lightning in a bottle again! CBS, please stop with the tired, retread tropes - they ain't working. Why not air this amazing series - paying all involved as if they'd done the work as professionals and not simply for love. I know that these episodes would become as deeply loved as the original series did. Thank you so much for all this phenomenal work, and for the great bow-out with the two-part closing episode. So many parallels with the original TOS, including some false starts in casting right through to a premature end at the hands of the rights holders! For sure we'll always wonder about those extra episodes that might have been. What wonderful surprises there were in To Boldly Go - when I saw Amy Rydell standing in for her mom, it was perhaps the most jaw-dropping 'reincarnation' of the whole project (which has many). Also brilliant was the scene where Spock gets a greater kicking than he ever got before in TOS, where Rydell is lured away from him. An absolutely brilliant moment of writing and dramatic execution. But I could go on. STC was not perfect, but neither was TOS. And like TOS, when it was good, it was great. And there isn't any 'Spock's Brain' in the whole bunch that needs shrugging off, either. You all did a phenomenal job. I hope the legacy of this series spreads out to the fans. It really deserves to. All the best, and thank you again, so much! I didn't think it would work, then I realized I couldn't wait for the next episode. I'm well aware of the hard work it takes to make a series...you did one hell of a job...thank you...bless you all ! I want to add my thanks for all the great work that you,the writers,the cast and crew did on every episode of STC. It appeared to truly be "a labour of love". I have really enjoyed this continuation of the original series. I feel like it was very well done considering the constraints of not being a full scale production company. I do wish a certain other project hadn't screwed the pooch for everyone by forcing CBS/Paramount to pull the rug out from under fan projects like this. I enjoyed the final two part episode, but I do have some bones to pick so to speak. I feel like you "jumped the shark" by pushing the boundaries of the technology of the era when you used the plot points of intraship beaming and saucer separation. The one time they used intraship beaming was extremely dangerous due to the limitations of the technology at the time. To posit the idea that it had become acceptable practice without benefit of any opportunity for technological upgrades is really a stretch. As for the saucer separation scene, the Constitution class ships were simply not capable of doing this in space. That plot point alone ruined the final episode for me. I would also like to point out that during that time period, the transporter froze them in place during transport because the targeting scanner did not have the capability of tracking the movements of a person during transport. The whole sad farewell scene in the transporter room was just too contrived for me. I get that it set the stage for Spock's decision to commit to the Kolinar ritual, but it just went too far. The loss of the councillor could have been handled better. I feel like the last two episodes were rushed to complete the series and sadly they suffered for it. I know I will probably rub some people the wrong way with my comments, but I've been watching Star Trek since I was a kid in the 70's from TOS to TNG, DS9, Voyager and Enterprise. I've had issues with some of their episodes as well. Voyager was the worst with ridiculous plots that made no sense. As far as I'm concerned, the Star Trek universe ended for me with the first reboot movie. I'll never watch anything new coming from CBS/Paramount. Thank you for giving me the chance to see the rest of the original 5 year mission and tying it into the first movie. I can live with the faults and blame it on the unexpected rush to finish the story. It was...fun. I was so impressed with your first episode, I was happy to contribute a small amount to your Kickstarter campaign (the only time I've ever donated to a KS project). Amazing effort! Looking forward to helping "What ships are for" get nominated for(and win!) the 2018 Hugo Award. Like all the rest, it was well written, produced, and performed. But most of all I loved the compelling (and very timely) story-line. I think does what all great science fiction does, namely have us see ourselves through a new lens. We will all miss your great stories. To Vic and team....thank you. You have put a more than worthy capstone on a series that I have always felt was prematurely canceled. You have forever placed yourselves in my heart as part of the canon of the original series and it is with a heavy heart that I am seeing you dock for the last time at Starfleet Command. I hope one day you once again head toward the second star to the right, and straight on 'til morning. Peace. For Vic and the rest of the crew....you've done Gene Roddenberry proud with STC..what a fabulous series that answers many questions about the fate of the Enterprise and raises a few new ones as well; sequels of a sort, and, in the case of a sacred sci-fi icon like Star Trek, can aways be a hazardous and thorny undertaking. Nonetheless, you've all undertaken the challenge most successfully with your reverence and love for the story and vision that is "Star Trek" revealed in in every frame. Thank you. STC is such a great work of love and integrity. It is really STAR TREK, that´s what it should be. Great show, but a grave error was made in calling the characters Kirk and Spock, etc. There's only one of each of them (Shatner, Nimoy, etc.). The crew should have consisted of new characters, i.e. Captain Smith, Science Officer Jones, etc., this crew serving on a different ship, example: the U.S.S. Independence or whatever. Otherwise, I love the idea to continue with the same look... the sets, the uniforms (especially the chicks in their mini-skirts), the same music, the ship sounds, etc. Very good, but I don't want to see anybody else play Captain Kirk except William Shatner. To put some young (and somewhat effeminate) dude in the role of Captain Kirk is a blatant mistake. The new guy playing Spock looks like he's 16 years old. The guy playing the ship's chief medical officer is fine, but to have him trying to be Dr. McCoy is just plain dumb. I like the actor, but call him Dr. Williams or Dr. Anderson or something. Along these lines, they did do something right in the episode 'Pilgrim of Eternity' …. the introduction of the new character named Elise McKenna. She's not from the old Enterprise crew. She's a brand new character and she comes across fine, very beautiful and very believable. I believed in her character, but when this new 'Captain Kirk' speaks, I feel like he can't wait to dock at the next pink planet so he can cruise the gay bars there. Too bad when they came to the choice of either: #1. using different actors to play the same characters; or, #2. using totally new characters, they chose #1 -- and in doing so, they made the wrong choice. Vic, as opposed to that Tracy person above, I feel you have payed a fantastic homage to Star Trek. You were/are amazing at channeling Shatner's Kirk. The final episodes had all of the pathos, camaraderie and bitter/sweetness of the original. If Star Trek could have had time to wind down, this would have been the actual final voyage. Thank you for everything. If you go to Toronto Comicon maybe I'll meet some of your crew there. Well done. I watched every episode, excellent. I do have a question. Are there still going to be set tours, since the sets have been sold? I just recently discovered STC, and let me tell you I'm completely blown away. When first viewing STC on You Tube, I thought I had stumbled upon a previously unreleased episode of TOS. Wow Vic, you really do resemble Bill Shatner. I want to thank you for the integrity of the series. No need to change the timeline to make the characters more relevant to today. One of the things I always loved about TOS was the morality of the crew of the Enterprise. Captain Kirk was wothy to be looked up to. As a kid growing up in the 70's, Kirk was my hero. It was truly enjoyable getting to watch him roam the galaxy one more time. Thank you so much for this unexpected gift.